Feelings of inadequacy enveloped me as I unfastened the clip and reached for the camera in my bag. Sitting comfortably on the sidelines, in the shadows of the trees, was a convenient cover as I attempted to manipulate this piece of equipment that had become so foreign to me. The buttons used to make sense. The symbols next to them, that once directed me to their meaning and purpose, now took tremendous effort to even decipher. 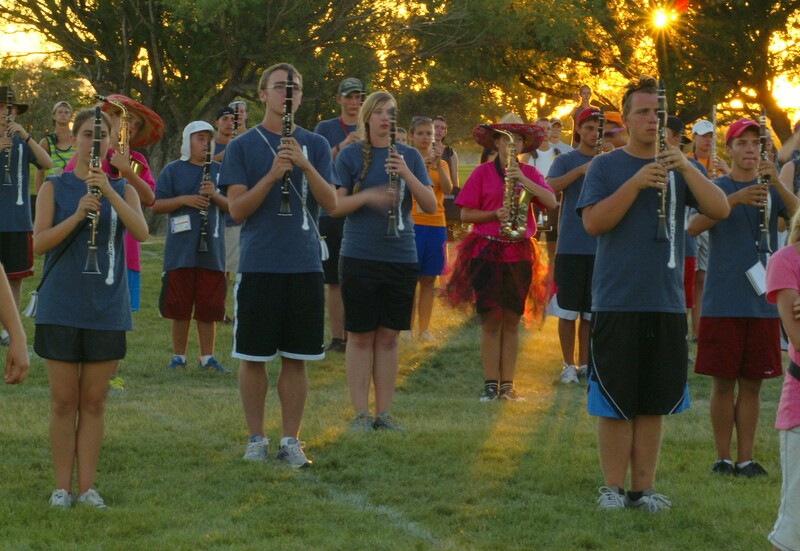 The span of dry grass filled was with marching band students and their instruments, but the only noise I heard was the incessant biting voices in my head. Thankfully it was that voice I chose to listen to that day. I have always been a visual person. An artist, graphic designer, and my most recent passion – photography. I was really focused on becoming a professional photographer and preparing to enroll in college when a strange shadow appeared in the upper right corner of my left eye. At first my reasoning it was just a symptom of chronic dry eye was enough to calm my concerns; until the pattern of the tile on the wall of my shower revealed it wasn’t a shadow at all, but actually an absence of vision. The Doctor had me come in right away. The realization set in as I walked into his office that I knew nothing about eye conditions. As he began to examine me, the first question he asked was, ” What did you eat this morning? I wanted to say; ” What the Sam Hill does that have to do with anything Doc?” but his explanation made perfect sense. My retina had detached and emergency surgery was imperative. This procedure required a specialist and before I left his office he had one lined up for me. Time stood still and flew by simultaneously as my fears clashed with ignorance. As the vitreous specialist began to examine my right eye he started dictating a bunch of medical jargon regarding a detached retina in my right eye, I interrupted, ” Oh no, It’s not my right eye Dr. its my left eye.” Hesitantly he replied , “I hate to tell you, but if that’s the case, you have detached retinas in both eyes. “ I still had no idea what a retina was. I did however understand that if we didn’t get it re-attached soon, my sight loss would become more extensive and permanent. That night I had two emergency surgical procedures. The first of 9 procedures over the course of 8 months. My eyes were filled with gases, and oils. I developed cataracts so the lenses were replaced, then a laser burned holes into the new lenses to make my vision clearer. My left eye detached twice; once into the macula, taking a good portion of my central vision with it. In an afternoon life had been altered with no clear cause, or outcome. Remaining optimistic at times was overwhelming. There were some upsides though; I was fascinated by the way the lights looked at night. They appeared 3 dimensional, like floating orbs. It was awesome how their brightness was multiplied and the spectrum of light took on a prismatic effect. I remember thinking this is way better than rose-colored glasses. The harder parts were losing my ability to drive, read, and how everything really became different. Stepping off curbs or negotiating stairs in public places were surprisingly tough. It taught me a whole new appreciation for yellow and red stripes on curbs and steps and how detrimental the absence of them can be. Each treatment left me literally with a different set of eyes. Constantly adapting to varying degrees of blindness, and vision. Each follow up appointment or procedure there was always a next step, more hope, for my sight to return. During a routine follow up appointment my Doctor unexpectedly told me. Hopelessness washed over me as I left the office and climbed into the car where my son was waiting. At first I couldn’t speak. I just kept replaying what the doctor had said. Then took a deep breath and told him that the blindness was permanent in the center of my left eye and my right eye was probably as good as it will get. I tried to be strong, but my tears told him more. His reply was so tender. I wanted to reassure him I was going to be okay. I felt embarrassed , this challenge was minor compared to what it could have been, and miniscule to what other people have faced. I should be grateful that my vision was stabilized and now restored in my right eye to a point I could probably drive. I had peripheral vision in my left. I could “see” but the reality that everything was different now was sinking in. Constantly adjusting to the capacity of ever-changing vision was part of a healing-repairing process that was leading to my sight being restored. As I left the doctor’s office, I realized these eyes were now mine to keep and my vision was as good as it was ever going to be. I put my double stacked readers on to read the smaller print on the panel. My backpack was filled with extra pairs since misplacing my reading glasses was a common problem. My left eye just bows out and closes so the right eye can have a fighting chance and I begin to dial in the settings. Shooting manually had always been my mode for photography. Settling for anything less would defeat my intentions entirely. Finally the settings were dialed in. I took a deep breath, brought the eye finder to my eye, only to discover my reading glasses were of no assistance here. The beat of my heart began to quicken. I took that first shot, and didn’t stop for 5 days. Funny thing, I couldn’t tell if the pictures I took were completely in focus or not by just looking through the viewfinder. It was so bright outside and difficult to really see the image on the playback screen outdoors. So each night after practice ended, I choose a dark corner and download the images to my laptop. As I review them I was amazed at how many were clear and in focus, and quickly deleted the ones that weren’t. I preferred manual focus to control the composition of my image. That worked great when I could see clearly but was a new obstacle for me . I would switch back and forth from my left and my right eye. Sometimes the peripheral part of my left eye could determine focal point better than my right. The more comfortable I got, the more I began to play with light and aperture. At one point I decided to try to follow one of the band members as they moved across the field at sunset just to see what kind of effect I could come up with. That night a spark of creativity reignited in me. As I unveiled my photographs of the day I discovered my first music in motion. Up until that moment, I didn’t know if I would have to find a new way to define myself. Instead, I realized that my eyes were allowing me to see the world, it’s beauty and my creativity all over again. It was as though I was rediscovering not only my vision, but all of my senses were being enlivened and the only limitations I would have, would be the ones I chose to put upon myself. The photograph featured above is the photo I took that evening. It’s not my finest work, but it was a new beginning. One that happened because I had a challenge with my vision, and was determined to spend 5 days on the field figuring out if I could still be a photographer. It was the perfect place to push myself to do something hard. Watching 220 American Fork Marching Band Kids work from sun up to sun down without complaint in and of itself a great motivator. This photo led me to an obsession. 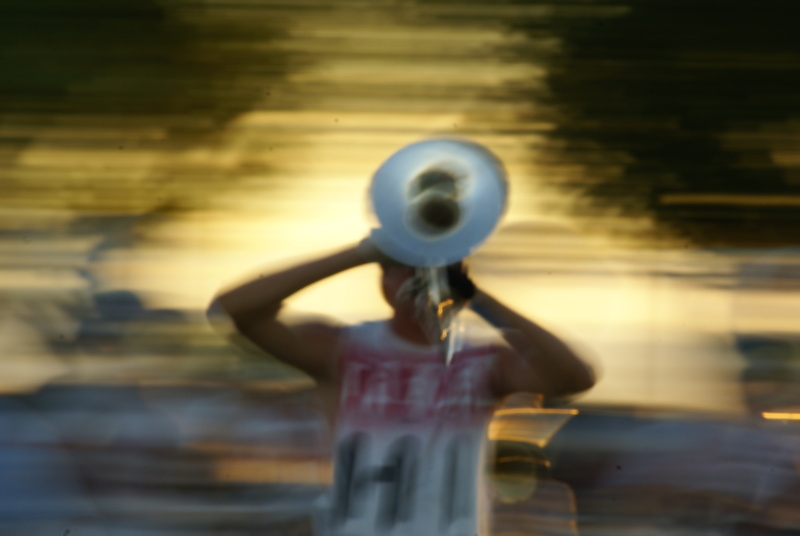 After camp, I began to experiment with capturing the essence of music in the art of Marching Band. I have a featured gallery called Music In Motion. I’m not sure what it is that I love most about this style. Is it the lack of focus, yet the attention to emotion? Is it because it shows the way I saw life through my new eyes; a little out of focus, yet I discovered a new reality of beauty in it? Is it because it captures how this style of performance makes me feel? Or is it just the fun in discovering and mastering something new? This was the beginning of acceptance for me. I was still aware of what I’d lost, and was trying to navigate my way back into a world that much like my camera had become foreign to me. That week was an opportunity to do more than just take pictures. I watched as young faces were covered in sweat, then coated in dust; yet somehow their smiles still made it through the mud. I too can find joy amidst my adversities. I saw the blisters on their feet, blood running from their noses, lips cracking from the sun. At one point a young man went off during a break to a quiet place and asked for help from God to give him strength to carry on. I too can turn to God to find strength when the burden seems to great for me to handle alone. I witnessed remarkable musicians, carrying each others stuff, helping with equipment and even assisting the adults in their duties; all so the burdens were lighter for everyone. My eyes were seeing more and more each day, recognizing their capacity; my capacity. I want my eyes to always be open to the needs of others. I will continue to be inspired by the example of those amazing musicians that not only saw the needs of others, but filled those needs with their own efforts. I was blind but am so blessed and now I see.